On Earth, something is always burning. 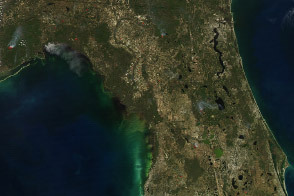 Occasionally, large wildfires send vast plumes of smoke streaming into the atmosphere, but most fires are much less dramatic when viewed from space, appearing in images as small blotches of light just a few pixels wide. Most of the smaller fires are prescribed burns lit by farmers to clear their fields of debris, but a portion of them are gas flares—natural gas fires that emanate from tower-like flare stacks on oil wells and rigs, refineries, landfills, and factories. Some flaring is done as a safety precaution at industrial sites, but flaring of excess gas too expensive to capture is also common at oil production sites. Unwanted gas is simply burned as it exits the stacks, giving flares the appearance of large torches. 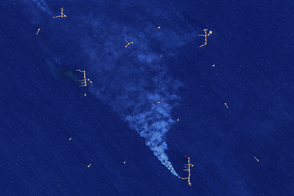 This photograph, taken by an astronaut on September 23, 2013, shows how gas flares appear as viewed from space. 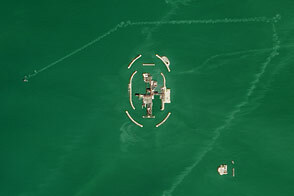 Two lines of flares that are part of the Zubair oil fields in southern Iraq are visible. The flares appear southwest of Zubair, a suburb of Basra, as orange blotches of various sizes. The size and brightness depends on the volume of material being burned off. Many of the flares near Zubair are among the 100 brightest in the world, according to a database maintained by NOAA’s Earth Observation Group. That database is built on observations made by the Visible Infrared Imaging Radiometer Suite (VIIRS) on the Suomi NPP satellite. 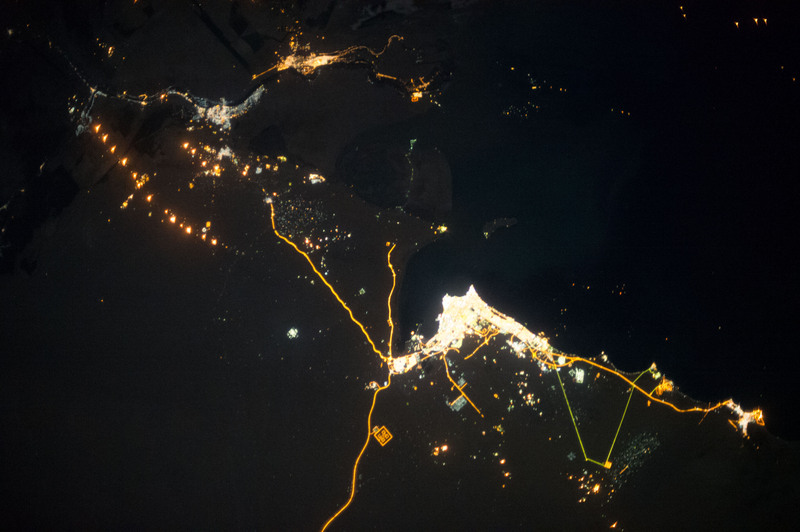 In the image, the city lights of Basra, Iraq, and Kuwait City, Kuwait, are also visible. Highways appear as solid yellow lines. The shoreline is difficult to see, but the waters off the Persian Gulf are slightly darker than land in some areas. Other dark patches in the image are unsettled desert. According to estimates based on satellite data, about 140 billion cubic meters of gas were flared globally in 2011 (the most recent data available). Since peaking in the 1970s at about 2 percent of total greenhouse gas emissions, the amount of flaring has declined to less than 1 percent. As of 2011, the five countries that flared the most gas were Russia, Nigeria, Iran, Iraq, and the United States. In Iraq, the volume of gas flaring peaked in the mid-1970s, plummeted between 1992 and 1996 due to the Persian Gulf War, and has increased since then. Iraq flared 9.4 billion cubic meters of natural gas in 2011. For comparison, the United States flared 7.1 billion cubic meters of gas. According to one estimate, about 70 percent of Iraq’s natural gas is lost to flaring. Astronaut photograph ISS037-E-3154 was acquired on September 23, 2013, with a Nikon D3S digital camera using an 50 millimeter lens, and is provided by the ISS Crew Earth Observations Facility and the Earth Science and Remote Sensing Unit, Johnson Space Center. 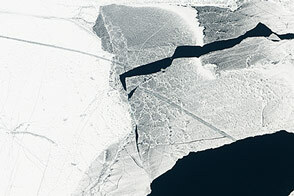 The image was taken by the Expedition 37 crew. It has been cropped and enhanced to improve contrast, and lens artifacts have been removed. The International Space Station Program supports the laboratory as part of the ISS National Lab to help astronauts take pictures of Earth that will be of the greatest value to scientists and the public, and to make those images freely available on the Internet. Additional images taken by astronauts and cosmonauts can be viewed at the NASA/JSC Gateway to Astronaut Photography of Earth. Caption by Adam Voiland. 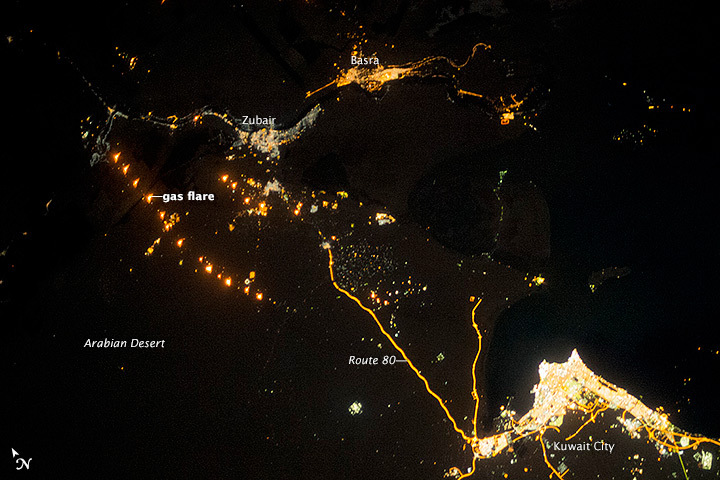 An astronaut snapped this image of lines of gas flares at an oilfield in southern Iraq at night. Elvidge, C. (2012, July 12) Satellite Data Estimation of Gas Flaring Volumes (pdf). Accessed February 14, 2014. Elvidge, C. et al. 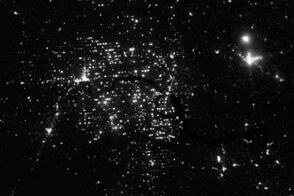 (2009, July 30) A Fifteen Year Record of Global Natural Gas Flaring Derived from Satellite Data. Energies, 2 (3), 595-622. Accessed February 14, 2014. Carbon Dioxide Information Analysis Center CO2 Emissions from Iraq. Accessed February 14, 2014. Casadio, C. et al. 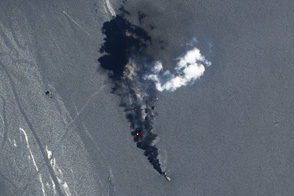 (2012, January 15) Gas flaring monitoring from space using the ATSR instrument series. Remote Sensing of the Environment, 116 (15), 239-249. Accessed February 14, 2014. NASA Develop National Program (2013, August 5) To Flare or Not to Flare. Accessed February 14, 2014. 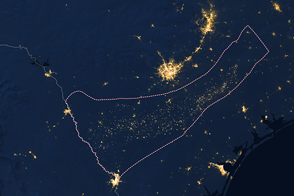 Space News (2013, October 21) Earth Science and Climate Monitoring | Researchers Turn to VIIRS for Tracking Oil Well Gas Flares. Accessed February 14, 2014. World Bank Estimated Flared Volumes from Satellite Data, 2007-2011. Accessed February 14, 2014. World Bank Gas Flaring Around the World. Accessed February 14, 2014.